Author Sylvia Torti will be discussing her new book Cages~ a novel about two scientists researching birds to uncover the origins of birdsong and memory. This event is presented by The Moab Festival of Science, The Grand County Library, and the Utah Humanities Book Festival. Urbanization has impacted night skies throughout the world. As of 2016, nearly one-third of Earth’s population was unable to view the Milky Way due to widespread light pollution. Aside from diminishing the cultural and aesthetic value of night skies, light pollution impacts human health, ecosystem functionality, and economic well-being. Although dark sky studies have emerged as a legitimate area of applied research, many knowledge and implementation gaps still exist. 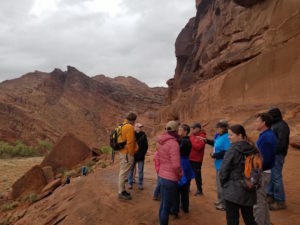 This study aims to foster awareness, planning capacity, and night sky friendly development in the rapidly evolving gateway community of Moab. To this enfridd, our project utilizes a pioneering, comprehensive, and streamlined lighting inventory procedure. Our lighting audit of public (and some private) lights will provide a baseline that local decision-makers can use to evaluate the potential benefits of lighting related capital investments, regulatory changes, and incentive programs. The baseline can also be used to benchmark on-the-ground changes over time. Because the lighting audit findings will be publicly available on ArcGIS Online, the project also supports citizen science and public participation in local government. This presentation will cover the lighting audit procedure, findings, policy recommendations, all of which may inform the City and County’s efforts to protect and preserve dark skies in the area. 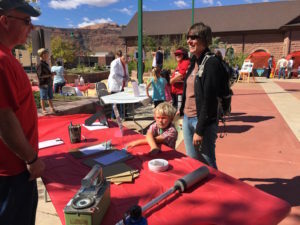 This social event will give community members the chance to chit-chat with local and regional science figures all while enjoying light refreshments and checking out the awesome Museum of Moab exhibits. Preeminent local scientist Dr. Jayne Belnap will give a presentation entitled “A Scientific Odyssey on the Colorado Plateau”. Dr. Jayne Belnap has been a world-renowned scientist working out of Moab, UT for the past 35 years. Jayne started her career in Moab with the National Park Service and for the last two decades has worked for the U.S. Geological Survey. Throughout her career, Jayne has studied a wide range of organisms and processes, including plants, animals, soils, soil microbes, biological soil crusts, fire, and invasive plants. In particular, Jayne’s work has had a phenomenal influence on biological soil crust science and she is known globally as ‘The Queen of Crust’. Jayne has also consistently worked closely with land management agencies and has had the good fortune of having much of her work become manifest as policy at the local, regional, and national level. In this keynote talk, Jayne will discuss the intersection of science, land management, and policy, and how we all, as citizens, can make a difference in a landscape we love. This event is part of the National Park Service’s celebration of National Public Lands Day. There will be a one-mile trash pick-up along the Windows trail. Bring water. Participants will get basic “Leave No Trace” instruction, a certificate for participation, and a coupon for free entry into a National Park. Saturday is a Free National Park Day. The STEMonstration will include multiple booths and hands-on kid-friendly science activities. Each booth will be hosted by a different organization or scientist so there will be something for big and little scientists alike! 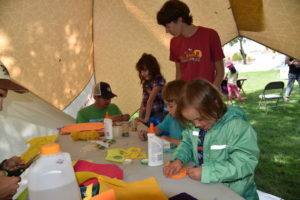 Come to Rotary Park to view desert fish and aquatic ecology through microscopes and make a T-shirt with dead fish! The event is hosted by local scientists Zach Ahrens and Tim Graham. Family friendly. Expert naturalist, Dr. Bruce Bauerle, will give an informal talk called “Edible, Useful, and Poisonous Plants of Southeastern Utah” aimed at helping to identify and utilize plants commonly found in the Moab area, while watching for others that can be harmful. All ages are welcome to attend! Come out to gaze at the night sky through high-powered telescopes and interact with night sky experts from Dead Horse State Park and Arches and Canyonlands National Parks. Come listen to National Park Service archaeologist Laura Martin discuss the region’s archaeology at the Moab Rock Art Panel (Courthouse Wash Panel). Come listen to Bureau of Land Management Paleontologist Rebecca Hunt-Foster discuss the Mill Canyon Dinosaur Tracksite. Come help Kara Dohrenwend of Rim to Rim Restoration with a revegetation planting along Mill Creek at Anonymous Park (just west of the BMX park). 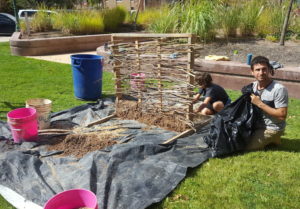 Planting will include longstem riparian trees and dryland grasses and shrubs. Bring gloves, water, and a sun hat!